I’m currently working on a cross-platform SQLite .NET wrapper. At the moment it’s not really thread-safe. So, I was looking for ways of making it thread-safe. Share a single connection among all threads and use .NET locking mechanisms. Let each thread have its own connection (thus no .NET locking would be required). To be able to make this decision, I did some performance tests and – assuming I did them right – got some interesting results you can read after the break. The tests ran on a Notebook featuring an Intel Core 2 Duo (2.53 GHz) and 8 GB memory. The OS was Windows 7 x64. There are 40 tests in the suite testing various combinations of the available test parameters (see below). Each test was executed for 1 to 20 threads to test concurrency. Each test for a certain thread count (1, 2, 3, …) ran 30 seconds and was repeated 10 times. Thus, the overall test duration was about 2 days. In each test scenario, the SQLite database contained only one table with four columns. For SELECT tests this table was filled with 50,000 rows of random data. Read access: Simulated by repeatedly selecting a random row from the table and reading all four values. Write access: Simulated by inserting random values into the table. The first batch of tests simulated read access, the second batch simulated write access, and the third batch simulated both concurrently. Note: In all tests, the CPU was the limiting factor – not the hard drive. Shared connection vs. multi connection: Whether all threads share the same database connection, or whether every thread has its own connection (to the same database though). Shared connections use SQLITE_OPEN_FULLMUTEX (serialized), multi connections use SQLITE_OPEN_NOMUTEX (multithread). Read-only: Whether the connection is opened in read-only or read-write mode (SQLITE_OPEN_READONLY). Shared cache: Whether all connections share the same cache (SQLITE_OPEN_SHAREDCACHE), or whether each connection has its own cache. WAL: Whether the connection(s) use a database in WAL (write-ahead logging) journal mode. Filled table: Whether the table to read from is empty or filled (not examined in this report due to missing data; I should mention though that trying to read from an empty table is significant slower than reading from a filled table). Let’s start with the tests only reading data (i.e. no data is written during these tests). Each thread randomly reads a data row and then obtains all four values stored in it. This is repeated for 30 seconds. First test is about whether opening a database connection in read-only mode (SQLITE_OPEN_READONLY) does result in any performance benefit. As you can see, there’s no benefit from choosing a read-only connection over a read-write connection (but it doesn’t hurt either). 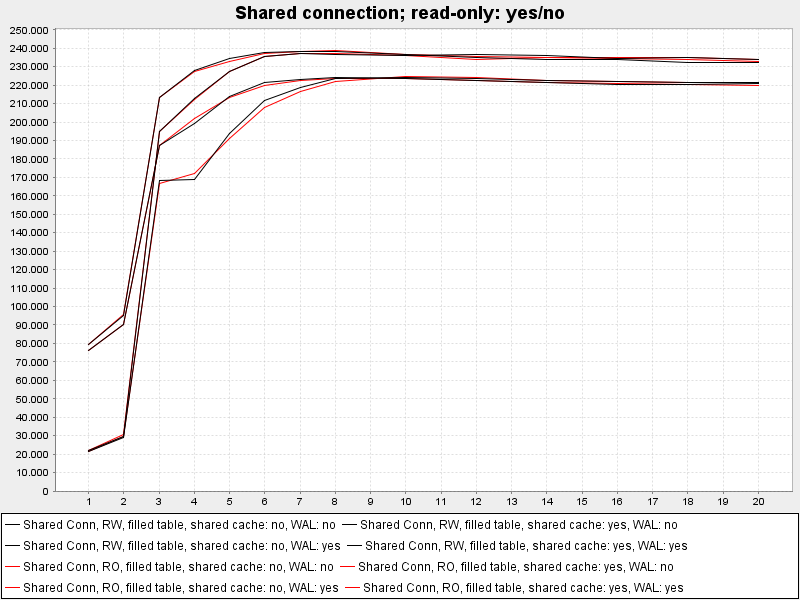 Next, let’s check whether using a shared cache (SQLITE_OPEN_SHAREDCACHE) affects read performance. 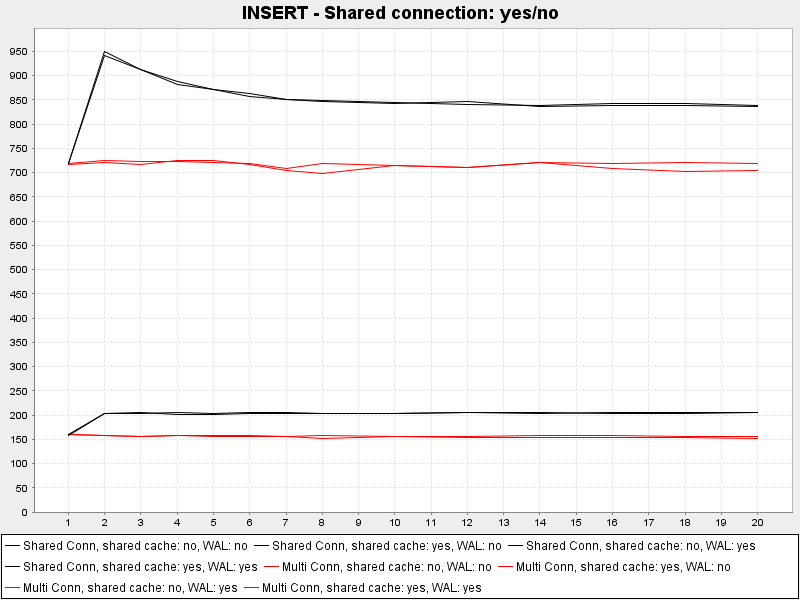 For a shared connection (first chart) you can clearly see that using a shared cache is never better than using a private cache. The same is true for multiple connection (second chart). Next, we test the use of WAL (write-ahead logging). WAL is (suppose to be) bringing a performance benefit for concurrent write operations (which we don’t have here). 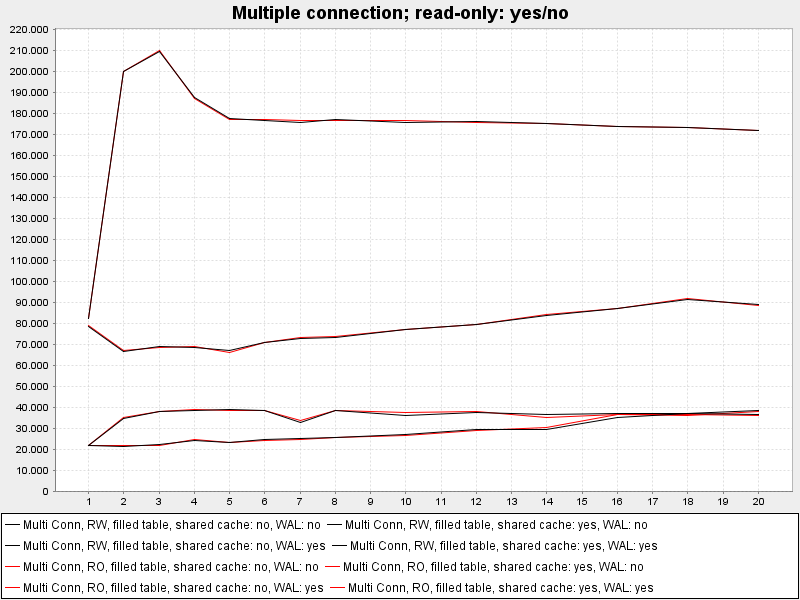 As you can see, with few threads, using WAL for read operations results in a big performance boost (400% for shared connection, 700% for multi connections). However, when using a shared connection and more than 8 threads, WAL doesn’t provide any performance benefit anymore (but it also doesn’t hurt). This chart only contains the variations for shared and multi connections with the best performance, i.e. 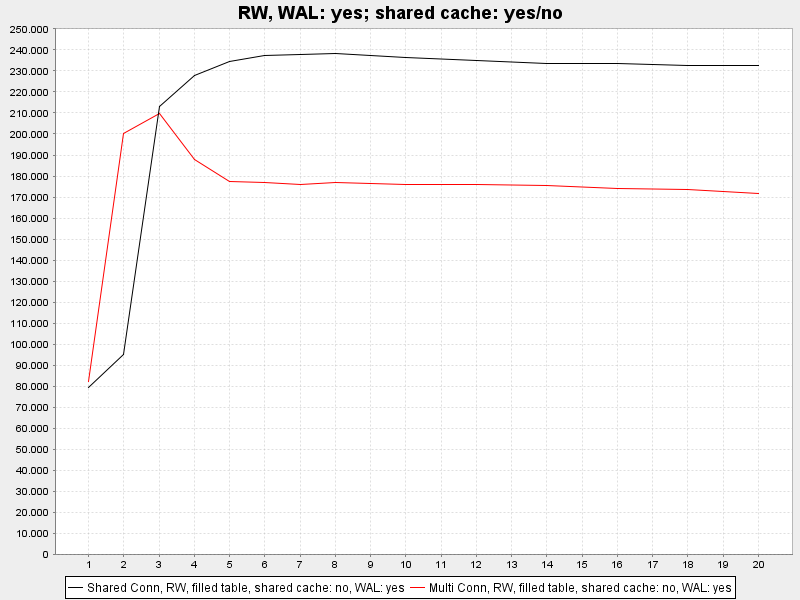 using WAL and no shared cache. As you can see, for very few threads (my guess: thread count <= cpu count), multiple connections perform much better. However, for more threads, a single shared connection is the better choice. Next, let’s look at write-only tests. With these tests, multiple threads concurrently write to the same database table, inserting random data. 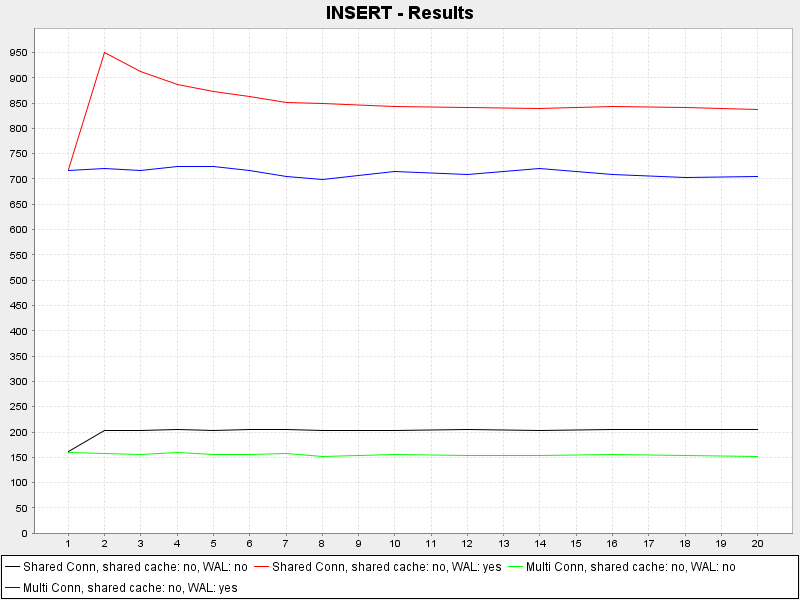 Our first tests checks the performance for when a shared cache is used. As you can see, there’s no real difference between whether a shared cache or a private cache is used. 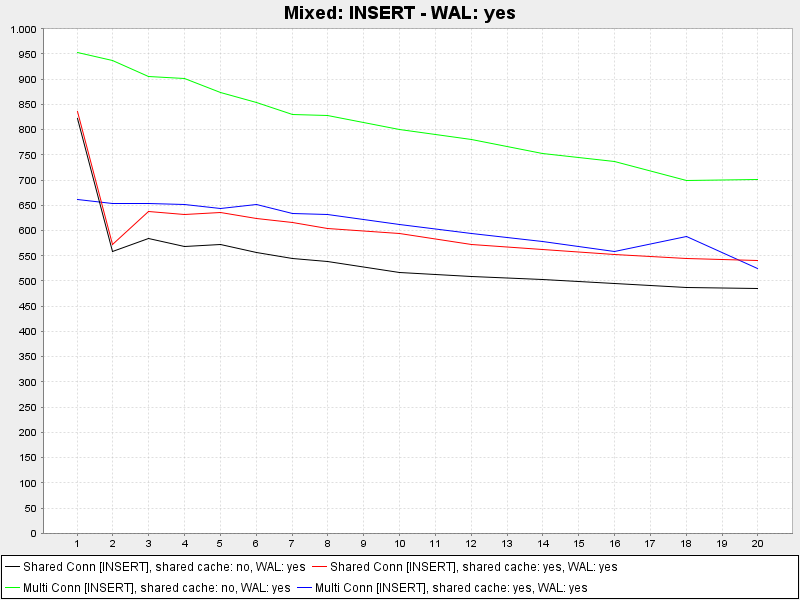 Next, let’s check WAL (which improved read performance significantly even though it’s designed for write operations). As expected, using a database in WAL mode drastically improves write performance. The last thing to tests is whether to use multiple connections or a single shared one. The results are clear. Using a shared connection always yields better write performance when using multiple threads. 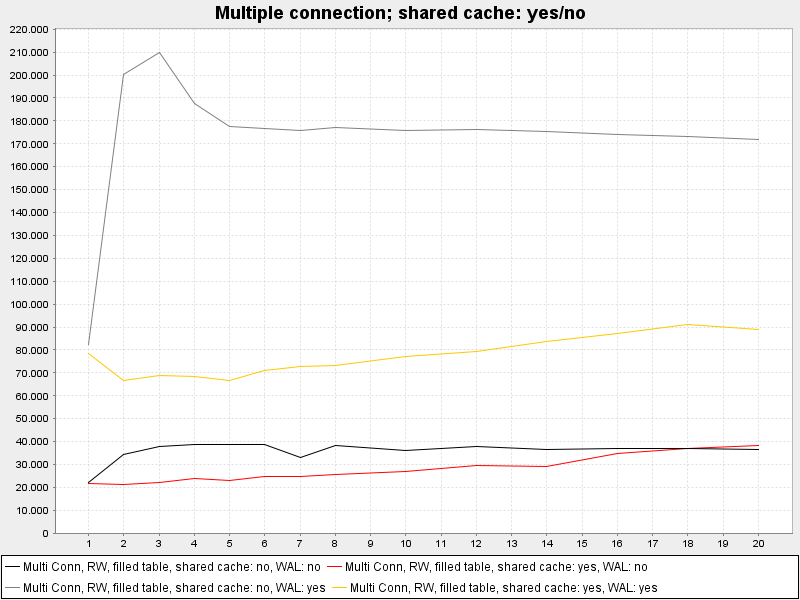 Using a shared cache doesn’t affect the performance. Using WAL improves write performance significantly. Using a shared connection is always faster than using multiple connections. The last batch combines the previous two batches. This time the same number of read and write threads read and write concurrently from/to the same database table. The previous tests clearly showed that enabling WAL improves read as well as write performance. Let’s check whether this is still true for concurrent reads and writes. 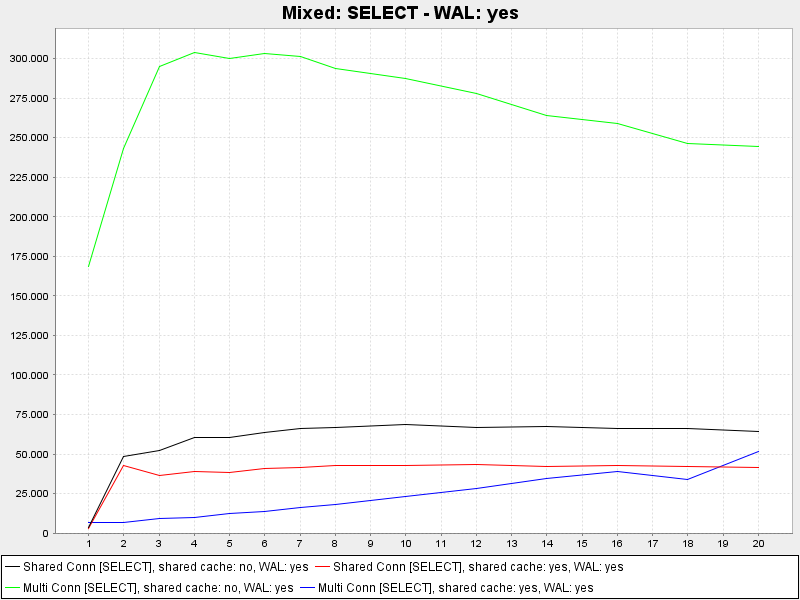 Again, enabling WAL results in a significant performance boost. Note: Reading without WAL is extremely slow (under 1000 rows per second for 10 threads or less). Next, check whether we should use a shared connection or multiple connections. 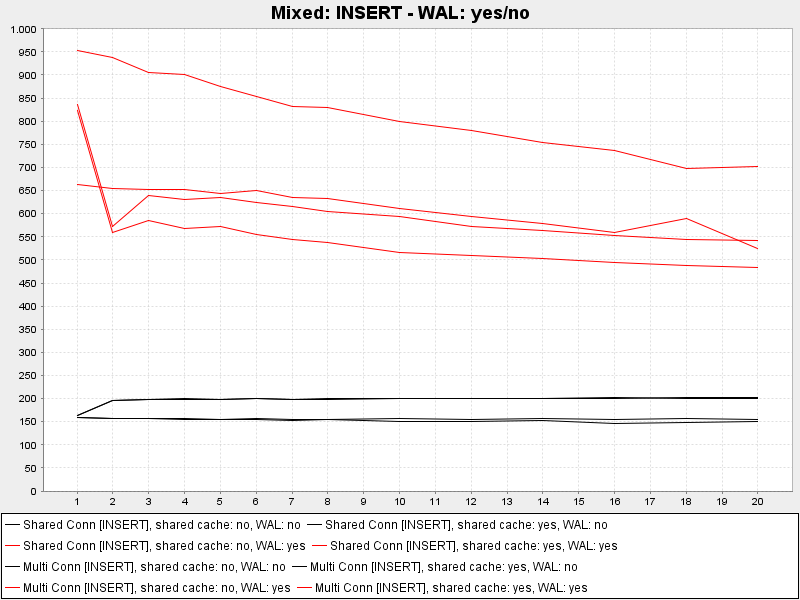 As you can see, in both cases using one connection per threads and using WAL provides the best performance. Enabling WAL for a database gives a significant performance boost for all read and write operations. 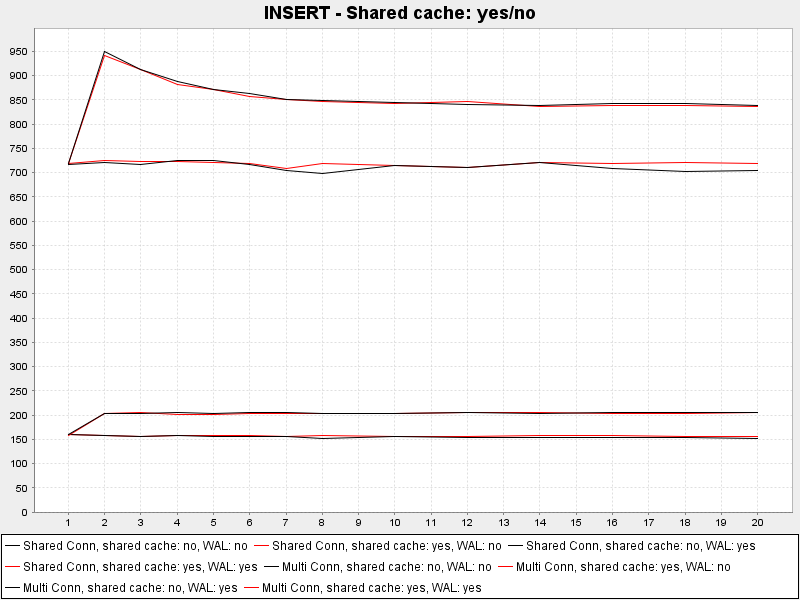 If memory is not an issue, shared caches shouldn’t be used as they may decrease read performance. Using read-only connections doesn’t affect the read performance. If you only have one thread, it doesn’t matter (obviously). If you do primarily writing, use a shared connection. If you do about the same amount of reading and writing, use multiple connections. I hope this helps. If there’s something (terribly) wrong with this analysis, please leave a comment below. Please note that these results are based on a Windows system. Other operating system may produce other results. Very nice and conclusive. 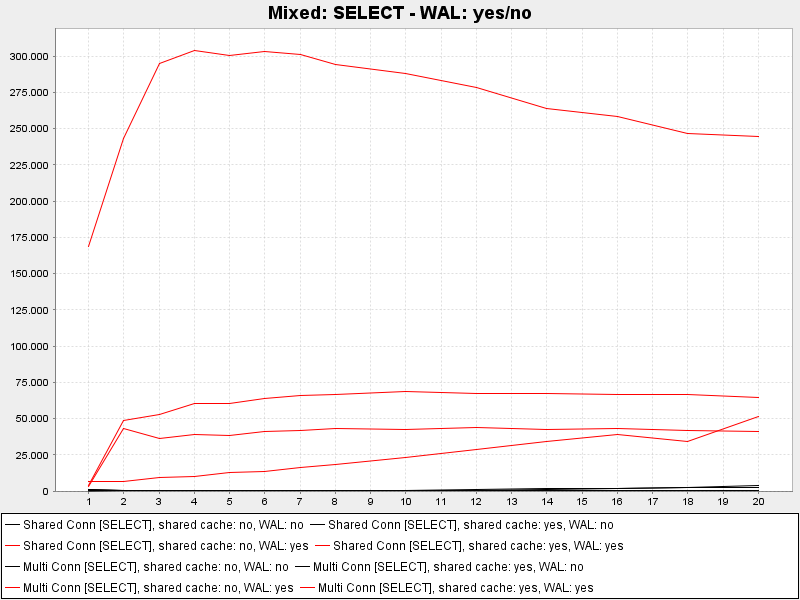 I was able to make a decission to switch from SHARED-CACHE to WAL after reading this. Keep it up. What is the measure of the y-axis? It’s the number of concurrent open connections to the database. i first find the block_size of my drive and set the page size to match when creating the db, that seems to help. and of course increasing the max # of cached pages up to the approx size of the db is very helpful. Thanks for the article, I am having similar issues and have made some headway with read only access, a separate connection per thread and the SQLITE_OPEN_NOMUTEX flag. before you call sqlite3_initialize() and performance should go up. I have an application where contention is an issue, and threads often timeout waiting for locks, and so I am experimenting with shared cache. I note that your write tests only cover inserts and not updates. Shared cache enables much finer grained locking and this is a consideration for me. Perhaps your testing could be expanded to such a scenario? Thanks for the suggestion. Unfortunately, I have moved beyond SQLite (at least for the moment). So it’s unlikely that I’ll integrate it into this post. However, if I’ll ever work with SQLite again I’ll have a look. The tests make sense for me. Thanks for the recording of your testing works. This does help me to improve the performance over 2-4 times when I was implementing my python persist-queue package. BTW, did you use the transaction for the insert or delete operation? If my memory is not too bad, the sqlite3 transaction performance cannot be worse, it can only finish 60 transactions(no WAL) in 1 second on a hard drive.